The card on the left is the one we did at the workshop, and that card uses all SU supplies. For the other cards I gave myself the liberty of using a variety of my Marvy Punches and the tent topper uses a rectangle and rectangle scallop Nestability Die by Spellbinders. And here’s a bookmark I made with a sleeve for gift giving — and I added jingle bells to this bookmark — I’ll probably give it to one of our God-children along with the gift card holder above! 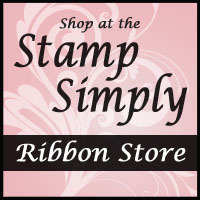 My Stamp Simply Challenge on Friday was to do one of these bookmarks with a sleeve. You can click here to find the tutorial. Ink: Black Stazon. Markers in Real Red, Certainly Celery, Only Orange, Sahara Sand. Accessories: Ribbon, Dimensionals, Crafter’s Tool Kit. Variety of punches and dies. Jingle Bells from Christmas craft section of Wal-Mart. Again, thanks much for looking and for all your comments!!! I truly appreciate it!!! If all goes as planned, my next upload will be a very pretty gift set — crossing my fingers that all goes well — LOL!!! What’s for Dinner? I found a recipe the other day for a crock pot chicken dish to be served over noodles on Nancy Riley’s Blog. I tried it and it was delicious!!! Even all my guys, who are meat and potato lovers, loved it!!! Check it out!!! Sharon all of these cards and the bookmark/holder are amazing. I love the Merry & Bright stamp set and of course the Dashing DP is probably my favorite. I can’t imagine any cuter set of cards & to think you did it so quickly, just blows me away. I love visiting your site and seeing all your fabulous creations. Thanks for sharing all your wonderful ideas!! Love, love, love this snowman ensemble Sharon, you’re a true creative genious! Awesome – I love this set! Sharon, another awesome grouping. You are the best at making all these coordinated projects. Each piece is a beauty in itself, but the bells on the book mark take the cake for me. Too Cool!!!!!!!!!! Hi Sharon; this is my first time visiting your site, but believe me when I say it won’t be my last! Your samples are amazing! I so appreciate you sharing them with us. Sharon, a thread at SCS sent me to your blog, and all I can say is WOW! You rock, and I’ve bookmarked it for regular checking and inspiration. This set of projects is soooo wonderful! Thanks for sharing and for inspiring me! Gorgeous! I love them all!! Really lovely set o cards Sharon! Thank you for sharing your art with us. OMG these cards are way to cute…love the Dashing DSP!!! I love the bookmark too – great idea!!! Just LOVE it! I have added your link to my blog. Hopefully I can send others to see your talent. Great job! Just too cute!! I love your added dash of black with the gingham ribbon. So clean and fresh!!! What beautiful projects! As always, thanks so much for sharing your creative talent with all of us! these are awesome, awesome projects. i just got this cute stamp set recently and your projects are so inspiring. Just when I think you have outdone yourself, then you do it AGAIN! Sharon, this set is FANTASTIC!!! You are amazing! Sharon these are a great example of how much you can get out of one stamp, much less a stamp set! Great inspiration for us all! These are so cute. Great job. Love how you were able to use all of your leftover paper. 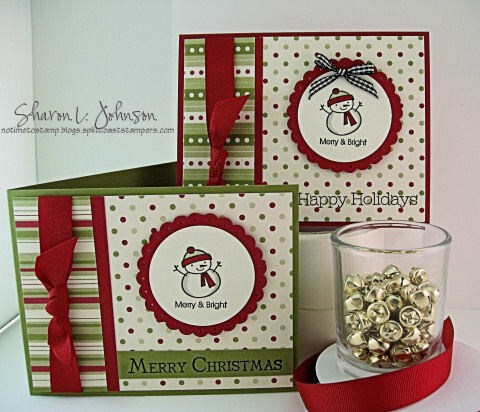 This set of cards is absolutely darling and I love love love your jingle bell bookmark! TFS! These are absolutely adorable!!! My daughter is jumping up and down because she thinks they are so cute! What an amazing ensemble!!! 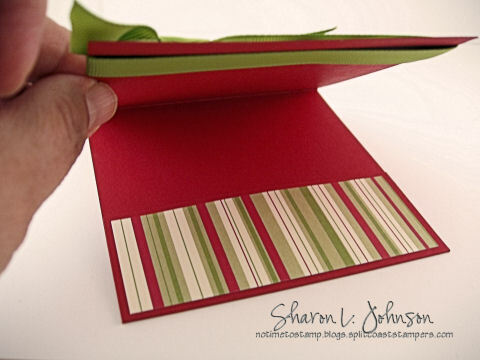 Each one is terrific — love the combination of layouts and papers! Oh my…you’ve been busy! I love everything you’ve created here! What an awesome set! I especially love your bookmark with the sleeve!! Cute! I forgot to add what a cute CUTE idea, tying the jingle bells into the ribbon!! Love it!! Wow!! These are so festive and CUTE! I love each one of these! That DP is one of my fav’s, you’re enabling me to get that cute little stamp set with this snowman!! Absolutely amazing, fabulous, wonderful eye candy! What a treat! Love, love, LOVE that paper! Sharon, what a fabulous ensemble! Everything you do is TOP-notch!! 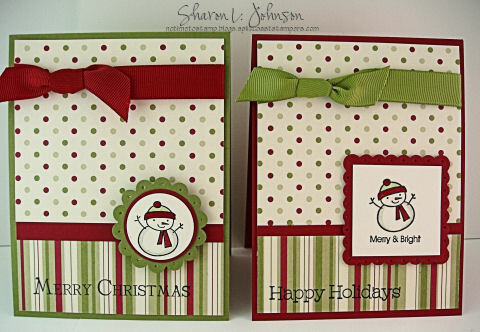 the top picture – the red in between the snowman and the DP paper – is that real red SU cardstock or ribbon? 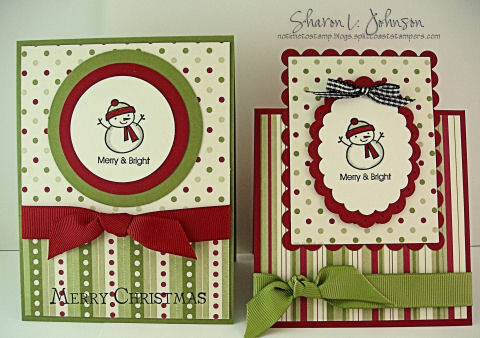 Sharon, this little snowman from Merry & Bright, along with Old Olive, Real Red, and Dashing DP have become my absolute favorites this holiday season! Your projects are fantastic !!! Thank you for the link! Glad you and the men enjoyed the recipe! Wow! this is quite the impressive collection, You are a very creative and talented women. Thanks for sharing your photos. Awww, these are sooo cute Sharon! The dp is gorgeous too!